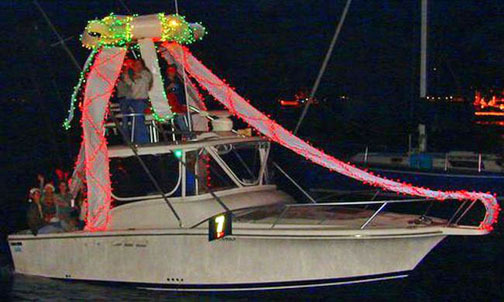 St, Augustine Yacht Club Regatta of Lights is Dec. 9. Putnam County vessels of all sizes will be on the St. Johns River. Holiday lights will twinkle from area waters this holiday season, as boat parades take the spotlight. PALATKA’s lighted boat parade on the St. Johns River begins at 7:30 p.m. Saturday, Dec. 9. Boats will line up south of the Boathouse Marina at 7:30 p.m. The event is open to all types and sizes of watercraft – sail or power, kayaks, canoes, rowboats, jet skis, trawlers. Prizes will be awarded by a panel of judges. First place is a month’s stay at the Boathouse Marina for a craft up to 45 feet. Electric is not included. For information call The Boathouse Marina, 386-328-2944 and ask for Marlene. SAINT AUGUSTINE’S Regatta of Lights begins at 6 p.m. Saturday Dec. 9. Vessels of all sizes from commercial fishing boats to yachts, sailboats and outboards will compete for a variety of prizes. The route is along St. Augustine’s bayfront between the Bridge of Lions and Castillo de San Marcos National Monument. Hosted by the St. Augustine Yacht Club, this 37th annual event awards 18 trophies in three classes – private under 25 feet; private over 25 feet and commercial. Trophies include the top grand prize of best overall, along with first, second and third places for most colorful, best theme and best in class. Winners are selected by a panel of judges. Awards for the competition are announced at the Yacht Club at a reception and awards ceremony following the parade and to which vessel captains and crews are invited. PALM COAST’S holiday boat parade, sponsored by the Palm Coast Yacht Club, gets underway at 6 p.m. Saturday, Dec. 16, from the Cimmaron Basin. The parade will be led by boats from Flagler County Sheriff’s Office, Tow Boat U.S. and the Florida Fish and Wildlife Conservation Commission. Boat captains are invited to contact Parade Captain Robert Ulis, 386-283-5166 or srulisoo@gmail.com for registration forms. Boats must be registered to participate. There are no entry fees. Rain date is Dec. 17.